Ever wanted to get caught out in the rain with a cute girl? Well now you can! Except the rain is actually a giant blob of goo and you are the cute girl. Adore the cast of cute female protagonists inspired by anime style art. Crush your competition with up to 8 player local vs-mode! Show your friends just how good you are! 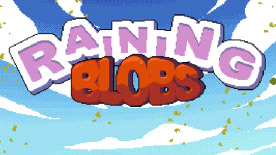 Secure your position as the undisputed Raining Blobs master by rising to the top of the leaderboards in Arcade Mode. Advance your way through a selection of fierce puzzle-based battles in Tournament mode. Collect a wide selection of challenging and rewarding achievements. Oh, and did we mention the cute girls?